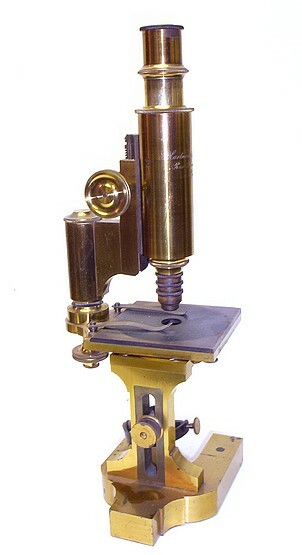 Note that the upper portion of the microscope can rotate relative to the base. This is an example of a large non-inclining model having the fine adjustment control located at the rear under the stage. 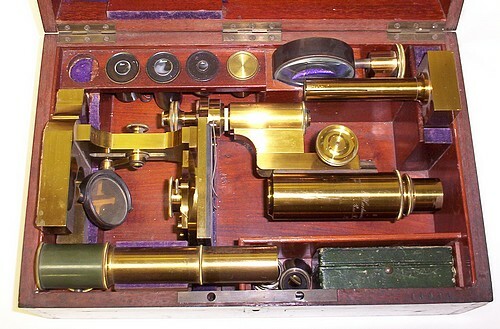 The microscope comes equipped with three eyepieces, six objectives where five are stored in a leather covered box and the last one is stored in a brass canister, a sub-stage aperture stop holder with three stops of different apertures, an Oberhäuser type camera lucida, and a free standing bullseye condenser. 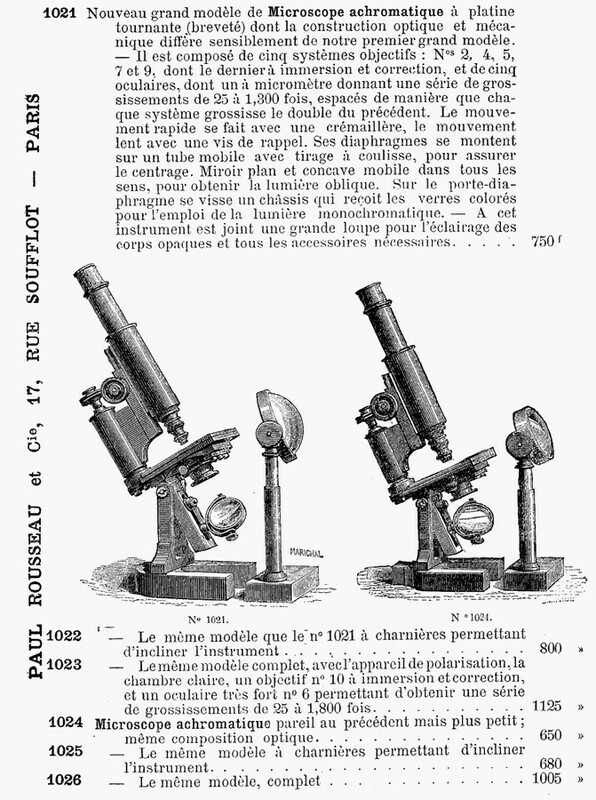 The following page was taken from the Catalog of Chemical Instruments offered by Paul Rousseau & Co., 1888. It indicates that these models were sold with or without the ability to incline. 1021 - New large model of achromatic microscope with turntable (patented) whose optical and mechanical construction differs significantly from our first large model. - It consists of five objective systems: Nos. 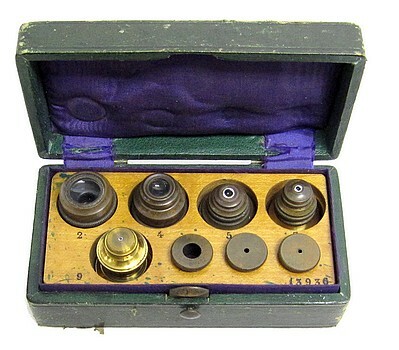 2, 4, 5, 7 and 9, the last of which is immersion and correction, and five eyepieces, one of them with a micrometer giving a series of magnifications of 25 to 1,300 times, spaced from so that each system magnifies the double of the previous one. The fast movement is done with a rack, the slow movement with a screw reminder. Its diaphragms are mounted on a movable tube with caliper, to ensure centering. Mirror plane and concave moving in all directions, to obtain oblique light. On the diaphragm holder a frame is screwed which receives the colored glasses for the use of the monochromatic light. - With this instrument is included a large magnifying glass for the illumination of opaque bodies and all necessary accessories. 1022 - The same model as the 1021 with hinges allowing to tilt the instrument. 1024 - Achromatic microscope similar to the previous but smaller; same optical composition. The same hinged model for tilting the instrument. For drawing microscopic objects the camera ludica will be found useful. This is a small glass prism attached to the eye-piece. 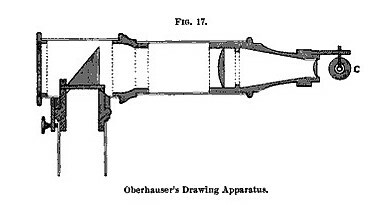 The microscope is inclined horizontally, and the observer, looking into the prism, sees the object directly under his eye, so that its outlines may be drawn on a piece of paper placed on the table. Some practice, however, is needed for satisfactory results. 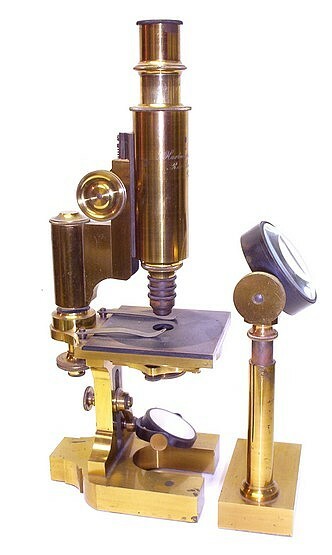 For the upright stands of German and French microscopes, the camera lucida of Chevalier & Oberhäuser is available. 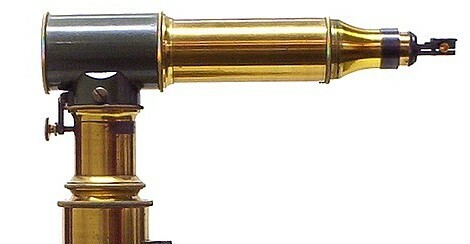 This is a prism in a rectangular tube, in front of which is the eyepiece, carrying a small glass prism (c, Fig. 17), surrounded by a black metal ring. A paper placed beneath is visible through the opening in the ring, and the image reflected by the prism upon it can be traced by a pencil. It is necessary to regulate the light so that the point of the pencil may be seen.